I'd originally planned to get to Hansa Park for opening, but incorrect use of the alarm clock in my hotel room put paid to that ambition. I managed to claw back about fifteen minutes thanks to some rather enthusiastic driving up the motorway, discovering the electronic limiter on my rental car, but even still I had just under three hours to spend at a park that under ideal circumstances deserves a full day. My visit was planned around the new Fluch von Novgorod (#1416), the first Gerstlauer Eurofighter to feature a launch section. Most of the approach to the park has been saturated with advertising for the new ride, and given that it was no real surprise to find a queue of over an hour. As luck would have it I found myself queueing with three teenaged girls, one of whom spoke in animated German for almost the full wait time with barely a pause for breath, making me wonder if I was listening uncomprehending to an interesting lecture on the general theory of relativity. The other two spoke only occasionally, and even my limited German was sufficient to decode the slightly bored yes yes and continue. At any rate, all three screamed their lungs out on board the train, which made for a particularly entertaining experience, albeit one which left me with a mild headache! The layout begins with a small section of dark ride which leads to the launch track which is engaged without the train slowing. The acceleration is particularly forceful, though the ride seems to taper out as the car breaks into the sunlight and onto the only visible section of the track. Once the train returns indoors however the story is quite different, with the signature vertical lift and ninety-seven degree drop leading into a furiously intense section of track taken in complete darkness. I've spent a few minutes trying to come up with appropriate words to describe the overall experience, and the best I can come up with is an upmarket version of Saw The Ride. The general theming is similar, though the machinery seen there has been replaced with more everyday effects such as cutting off fingers and hands. There are a number of special features in the queue, including a maze at the ride exit featuring live actors; my teenaged companions had a particularly good time here! Though there would have been time for me to ride a second time it would have been at the expense of everything else. Given that, I decided to take it easy. 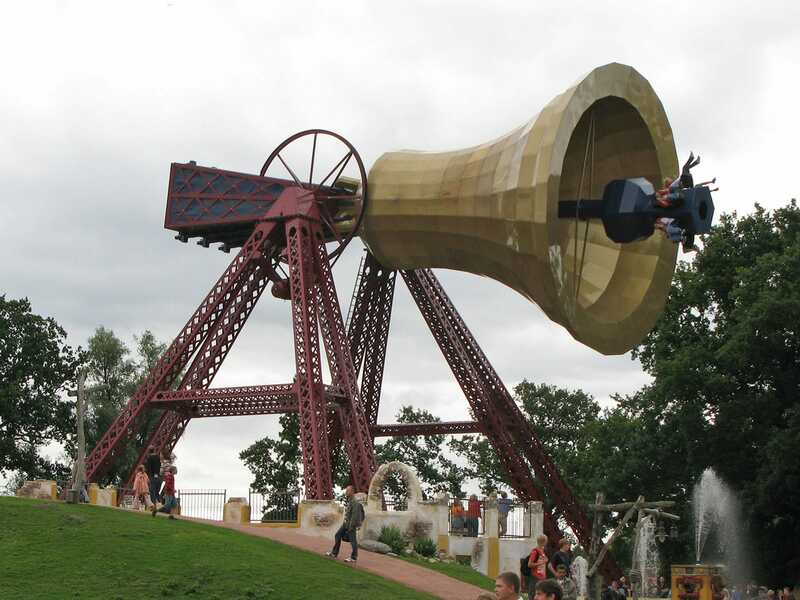 I took a trip up the observation tower, before wandering over to look at the most interesting change since my last visit, a rather mad looking flat ride called The Bell. I'd have joined the queue but based on the loading speed I figured that I wouldn't make it to the front in time for my flight. As it was I decided to finish up my visit with a lap on Rasender Roland and two laps on Nessie.